As the Colonials took the field for a three-game series over the weekend, they faced more than one opponent on the newly-installed turf at Barcroft Park. With weather forecasts shifting the weekend’s schedule and moderate rain falling for most of the third game, GW was forced to overcome mother nature’s lingering presence, as well as the efforts of A-10 rival La Salle. After dropping the first two games of the series to the Explorers by respective scores of 7-4 and 2-1, the Colonials (7-16) stormed back Saturday, winning a tight third game by a margin of 6-4. Despite giving up the lead late in the second game and ultimately falling short, GW showed no signs of layover in the nightcap, putting forth a winning combination of solid pitching and clutch hitting. Junior Tyler McCarthy prepares to send the ball to home plate amid his back-to-back strikeouts during the third game. The Colonials first fell Friday and again Saturday afternoon when Friday’s night game was postponed to the next day due to lightning. La Salle took advantage of two GW errors to take an early 5-0 lead in the first game of the series. 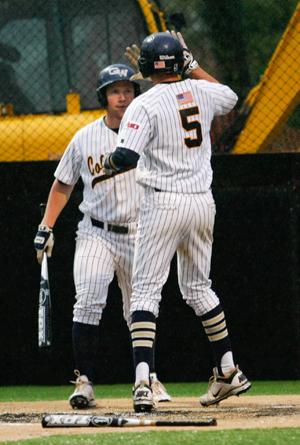 Though GW attempted to mount a comeback with a brief offensive surge, the Explorers hung tough for a 7-4 victory. In the second game of the series, the Colonials at first appeared to have control. Led by a solid pitching performance from sophomore Aaron Weisberg, GW had a 1-0 lead heading into the top of the seventh. But when the game was resumed Saturday, the Explorers scored two runs right off the bat, taking a 2-1 lead that the Colonials failed to overcome. In the third game of the series, La Salle took an early 1-0 lead in the first, but the Colonials responded with two runs of their own in the bottom half of the second. Junior pitcher Tyler McCarthy settled down in the second and third innings, ending the day with only two earned runs over five innings of work. Following McCarthy’s exit from the game, pitchers Colin Milon and Justin Albright were each summoned from the bullpen, turning in a combined four innings of work, while giving up one run on two hits. Upon reaching home plate, senior Brett Bowers is congratulated by sophomore Brookes Townsend before the shortstop goes up to bat. 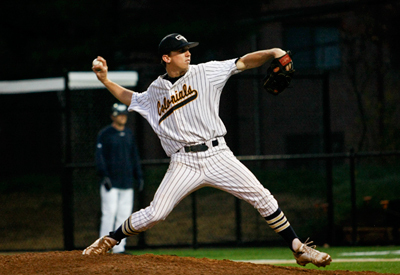 The Colonials hung tough through LaSalle comebacks in the fourth and seventh innings. GW’s middle to bottom of the lineup hitters came through in the clutch yet again, this time in the home half of the eighth. Sophomore Owen Beightol walked to start the inning and following a double by senior Jimmy Best, two runners were on base for hot-hitting junior Ryan Hickey. Already two for two with two singles on the day, Hickey lined a one-out fastball through the left side of the infield, driving in two runs and putting the Colonials up 6-4. Regardless of the two losses, Mrowka was encouraged by the Colonials’ ability to come back and take game three of the series. Though GW’s record is far from perfect, Mrowka feels his team has both talent and potential, and looks to boost its play to the heights he believes are within the team’s reach.